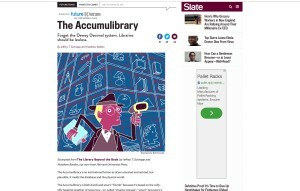 An excerpt from Matthew Battles’s and my The Library Beyond the Book was published in today’s online edition of the Future Tense section of Slate, entitled “The Accumulibrary. 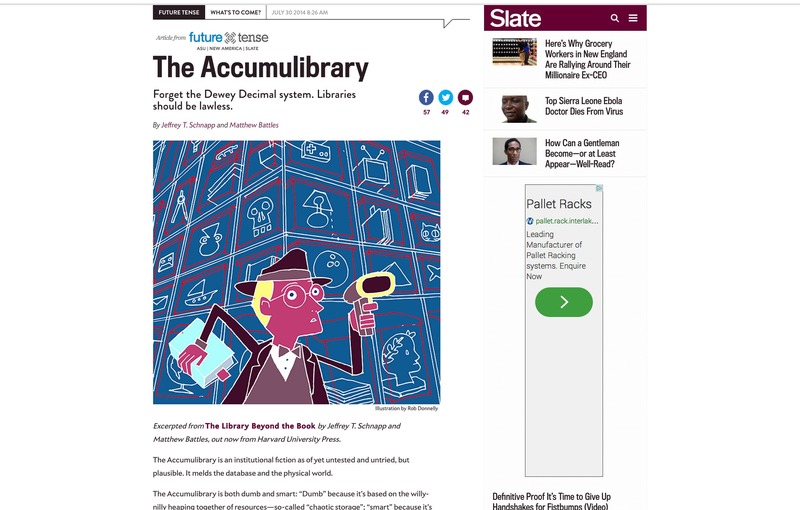 Forget the Dewey Decimal System, Libraries Should be Lawless.” (The neologism is ours; the title is of Slate‘s devising.) The chapter in question, far from providing a cross-section of our book’s larger argument, stands apart as a willfully speculative, fictional, and polemical scenario, preceded and followed by a diversity of other not-so-speculative, historically grounded scenarios, regarding the library’s future as a socio-cultural institution. This in a book whose overarching theme is the need for a variety of innovative, well-designed, imaginative, sensorially rich physical environments for knowledge sharing, pleasure, rumination, and research. The Slate online comments stream, somewhat inevitably, rises to the chapter’s polemical bait and fails to intuit the book’s broader claims: that browsing and serendipitous encounters remain fundamental to processes of discovery; that social reading in shared spaces is just as important today as it was in the respective eras of Cassiodorus and Erasmus; that every scheme of organization, from Callimachus to Dewey and beyond, is a historical construct shaped by a given set of cultural and social beliefs; that data are not simply given or disembodied, but constructed and embodied. In short, The Library Beyond the Book is engaged in advocacy on two overlapping fronts: for innovation as regards the need for new library typologies based upon those that history has provided us; and for continuity as regards affirming the library’s enduring value as a place of gathering and communion between people, space, and information.